Phase two of the construction of a $10 billion underground sewage superhighway, one of the world's largest, started yesterday. The Deep Tunnel Sewerage System (DTSS), which will be the conduit for all used water islandwide, will boost water recycling and free up space in land-scarce Singapore. When Phase 2 is completed in 2025, the sloping infrastructure of giant pipes will harness gravity to channel used water in the western parts of the island to a new water reclamation plant in Tuas. Phase 2 of the project by national water agency PUB, which costs $6.5 billion, will also free up an additional 83ha of land - about the size of 116 football fields - currently housing the Ulu Pandan and Jurong water reclamation plants, about 70 pumping stations and many more sewage treatment plants. Minister for the Environment and Water Resources Masagos Zulkifli marked the start of construction at a ground-breaking ceremony in Penjuru Road in Jurong East. He said: "We have experienced how unpredictable weather patterns can be, and we expect dry seasons to worsen with climate change. It is, therefore, critical to augment our water sources by reclaiming water, so it can be used again and again, in an endless cycle." DTSS Phase 2 will boost Singapore's NEWater supply, he added. The DTSS will eventually channel all of the island's used water to water reclamation plants in Changi, Kranji and Tuas, where it will be treated and purified to either produce NEWater, or be discharged into the sea. The tunnels, which sit under the Republic's rail network and above its electricity grid, slope downwards towards the three plants as they are dug at a gradient. Phase 1, which cost $3.4 billion, was completed in 2008. It serves the eastern parts of Singapore, channelling used water to the Kranji and Changi water reclamation plants. DTSS Phase 2 will stretch 30km across the western part of Singapore, starting under Keppel Road, at 35m below ground, and following the Ayer Rajah Expressway (AYE) all the way to Tuas Road, where it will be 55m below ground. 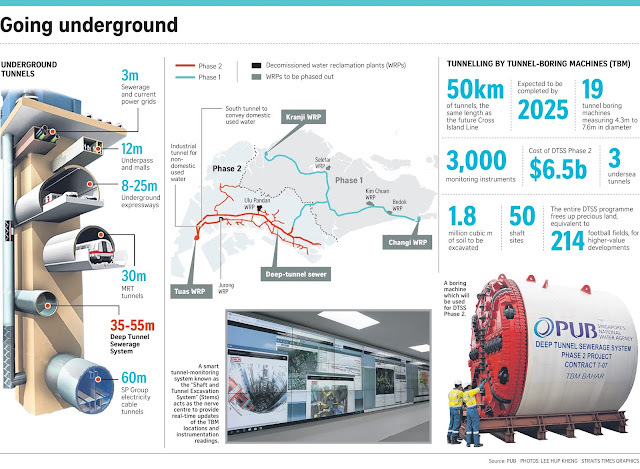 It will also include a separate 10km tunnel in Tuas for industrial used water. PUB has appointed five contractors to design and build the tunnels, including home-grown company Koh Brothers Eco Engineering. The deep tunnels and link sewers alone will cost about $2.3 billion. The 30cm-thick tunnels in DTSS Phase 2 will be constructed with several safety features. They will be lined with a special concrete and high-density polyethylene (a type of plastic) to protect against corrosion, particularly from bacteria and other microorganisms, and gaseous fumes from sewage. Sections under the sea will have an additional waterproof membrane layer. Fibre optic cables will be embedded in the concrete lining to monitor the structural integrity of the tunnels remotely - detecting, for example, cracks. There will be 18 shafts which will allow human access. Each will come with gates that can be lowered to isolate certain sections of the tunnels for repair works. Air jumpers, essentially giant fans, within the tunnels will be used to direct sewage fumes to four odour control facilities. With these features, the tunnels are expected to last 100 years. Mr Yong Wei Hin, director of DTSS Phase 2 at PUB, said the construction "will pose a new set of exciting challenges for us". "There are a lot of sedimentary rocks and cavities along the way, which is not ideal for tunnelling," he said. Work has begun on a massive underground sewerage superhighway in western Singapore - the most ambitious project of its kind here to date. On track to be completed in 2025, the underground labyrinth of pipes will comprise 40km of deep tunnels and 60km of link sewers, traversing 100km across the western half of Singapore, including the downtown area and some new developments in the Jurong Lake District, Tengah Town and the Greater Southern Waterfront. Used water will be conveyed via gravity to an integrated used-water and waste-management plant - the future Tuas Nexus - for treatment and recycling into Newater. Highlighting the economic benefits of DTSS (Deep Tunnel Sewerage System) Phase 2, national water agency PUB said it will allow 150ha of land - the size of about 200 football fields - to be made available, as older existing water reclamation plants and pumping stations around the island are phased out. These include the conventional water reclamation plants in Ulu Pandan and Jurong, and the intermediate pumping stations. Work officially began yesterday at a PUB site in Jalan Bahar with the unveiling of the first tunnel-boring machine, which will create tunnels 3.5m in diameter below ground. The first phase of DTSS was completed in 2008 to serve eastern Singapore. In the second phase, PUB will break new ground in a bid to make Singapore's water systems more sustainable. Once tunnelling work is completed, used water from homes, offices and industries will be conveyed via two tunnels - the 30km South Tunnel, which is for domestic use, and the 10km Industrial Tunnel, for industrial use - to the Tuas Nexus. Phase 2 will cost $6.5 billion, with $2.3 billion devoted to 19 tunnel-boring machines. Minister for the Environment and Water Resources Masagos Zulkifli officiated the launch of the DTSS Phase 2 tunnel-boring machine yesterday. "This is another key milestone in one of Singapore's most significant water infrastructure projects. It is a significant and necessary investment to meet our population's long-term water needs," Mr Masagos said. He added that the DTSS would allow for every drop of used water to be continually reused. He said: "The DTSS will transform our used water system to support our growing water needs, and ensure an effective and efficient sewerage system for Singaporeans." This second phase of the DTSS will also be the first time that smart tunnel-monitoring systems and fibre-optic sensors will be used to detect problems before they pose real risks. For instance, a smart tunnel-monitoring system known as the Shaft and Tunnel Excavation System (Stems) will act as a nerve centre, providing real-time updates on the location of the tunnel-boring machines, making sure that operations throughout the construction period remain safe and run smoothly, with minimal disruption to urban structures above. There will also be a fibre-optic system in place to monitor the structural integrity of tunnel linings. Additionally, isolation gates will be put in place to allow parts of the tunnel to be sectioned off for repair work. The DTSS Phase 2 will also be the first project in Singapore to use ventilation equipment called air jumpers, which manage air flow in the tunnel by pushing odorous air farther downstream to be treated at an odour control facility.